A serger is a wonderful addition to any sewing room; in fact, many sewers (or sewists; whichever term you prefer), say that a serger is one of the most important sewing essentials. But if you’ve just purchased this type of specialized sewing machine and are exploring all of the different types of stitches that it can create, you might be trying to figure out which stitch is the right one for your project. In this sewing help guide, we’ll go over some of the different serger stitches so that you can choose the right type for the sewing fabric that you are working with and the garment that you are creating. Of all the different stitches that can be made with a serger, the 4-thread stitch is the most commonly used. In fact, if you take a look at the shirt or pants that you are wearing right now and you’ll probably find a 4-thread overlock stitch somewhere. With this type of stitch, the looper threads join at the edge of the fabric and lock in with two needle threads along the stitching line. The 4-thread overlock stitch provides great stability, as the extra thread secures the looper thread. Given it’s stability, this type of serger stitch is best suited for making seams in materials that can easily unravel, such as knits, muslin, felt, and linen. With this type of serger stitch, the looper threats entwine along the edge of the material, similar to a 4-thread overlock stitch; however, as opposed to two needles, a single needle is used to create this serger stitch, therefore, it isn’t quite as durable. The benefit of this type of stitch over the 4-thread overlock is that it’s more flexible, so it isn’t as stiff. It’s best suited for garments that won’t have a lot of stress put on them, but still require a hem, such as drapery. You could also use this type of serger stitch to create a blind hem. 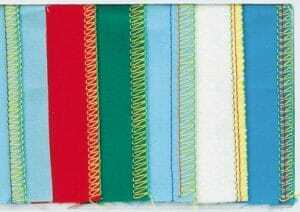 With this serger stitch, the needle thread sits along the bottom of the fabrc, the looper thread sits along the top, and the threads join together at the edge of the material. It’s not very durable, as it is lightweight and has a lot of stretch, so it isn’t the best choice for sewing a seam; however, it’s great as edging on delicate materials, such as satin, lace, or taffeta. There is a 2-thread and a 3-thread variation of this type of serger stitch. It’s often used to create a seam on sheer materials, as it can finishes the edge and can add to the design; especially if a decorative thread is used. The 2-thread rolled hem is perfect for projects that you don’t want to the hem to add extra weight to, such as tablecloths or cloth napkins; however, the 3-thread variation can also be used, as it gives a fuller appearance, but do note that it does add a bit more weight.